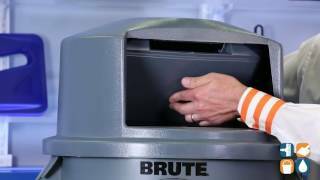 Turn your Brute 32 gallon trash container into the perfect outdoor trash can for your location with Rubbermaid's Trash Can Lid. With a spring-action push door and snap-on design, this lid is perfect provides a great waste management and odor control option. Rubbermaid’s 32 gallon trash can lid is made from professional grade plastic that is resistant to rust, dents, chipping and peeling. 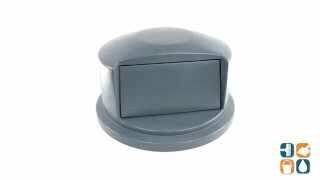 Designed to fit most 32 gallon trash cans (RCP2632GRA, sold separately) this lid is CSFM Approved for fire safety when used with the appropriate trash container. Dimensions: 22.7" in diameter, 12.2"H.